Some things don’t change. We still love this meal. We still watch Biggest Loser. I won’t get into the controversial aspects of the hit TV show (mainly because I agree with both sides). I will, however, thank them for this recipe we tried years ago…and continue to make time and time again. If you’ve been reading along for awhile, you may have noticed a fondness I have towards recipes that include “faux frying”…the end product of a crispy, fried-like exterior, but without all the added calories and fat. Because here’s a little secret. Fried foods are loved by all…dietitians, too. The only difference is we fully recognize the short-comings to be found among all that is fried and hopefully choose to partake on a very infrequent basis. But here’s where a little effort can pay off big time…because I like to have my cake and eat it, too…and the less calories, the better. Why not faux fry when you’ll never miss the “real deal”? Besides, a Fry Daddy is no simple, mess-free endeavor. When Kroger up and decided to remodel and rid their shelves of breadcrumbs for the better part of a week, I had to get a little creative with this recipe. Mr. Prevention has dietary NEEDS that NEED to be met (read: Biggest Loser “Fried” Chicken), and I cleverly called upon ground flaxseed to supplement the lack of breadcrumbs in this post. 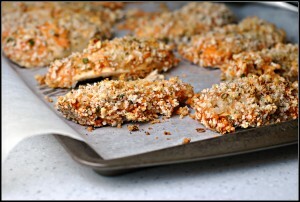 While they need a shortened baking time (the breadcrumbs, not the chicken), it worked great. Other than a slightly darker color, that hubby of mine was happy as could be. Result: Good as ever! Always a favorite! It’s a perfect, healthy, comfort food meal. An oldie but goodie in the Prevention Kitchen…never disappoints! Enjoy! While the chicken recipe is nothing new to the blog or us, I did step things up a notch with making a homemade honey mustard dipping sauce. As a loyal Ken’s Honey Mustard consumer, I was sure I would find nothing to compare. But I was wrong. It doesn’t get much simpler OR more delicious than this. It’s a good thing there wasn’t a straw or spoon around…it could’ve been trouble. YUM! Whisk ingredients together and refrigerate until ready to serve. Yield: 12 tablespoons. Result: So good! Amazing! May even beat out Ken’s…mmm!! I am hitting the road tomorrow morning to head back to Ohio, so I will likely unplug for tomorrow and catch you all on Monday…with an amazing vegetarian Mexican meal we loved! Off to enjoy the wedding day of two great friends! 😀 Can’t wait! Question: What’s your favorite dipping sauce? Why not use regular bread and make breadcrumbs in your food processor? I would’ve…if we had bread 🙂 But the flax was great…and I’m all about sneaking in those omega-3’s! I hate the Biggest Loser. I think we’ve had this talk before. However, this recipe sounds marvelous! Maybe they will start making it with flaxseeds (or include your motification in their next million dollar cookbook! ), because I think the darker color makes these look more appetizing, don’t you? They look more “Fried” when they are darker. Oh, and by the way…….. GOOOOO BUCKEYES!!!!!!!!!!!!!!!!!!!!!!!!!!!!!!!!!!!!!!!!!!!!!!!!!!!!! I love BBQ for my dipping sauce but this mustard looks incredible! Is that mashed potatoes or mashed cauliflower? 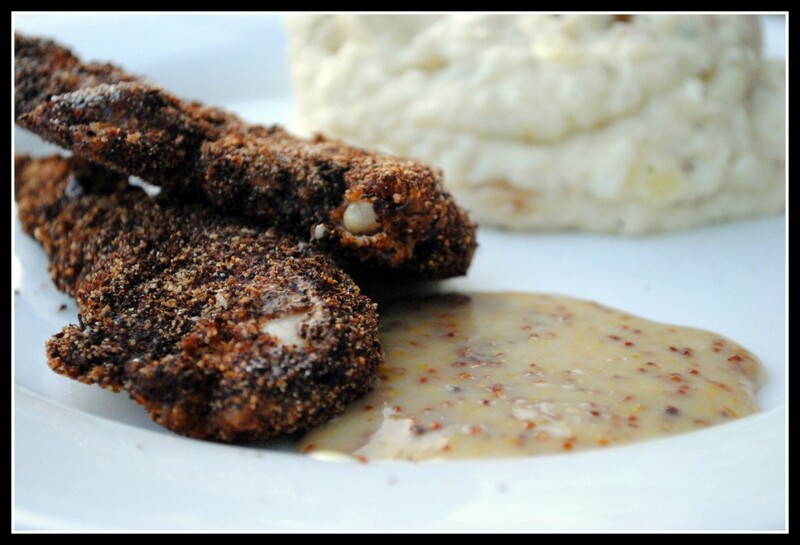 I always serve my ‘faux fried’ chicken with mashed cauli…yum yum!! I like the flax seed crumb, I have tried ground fiber one and wheat germ to work pretty well too! 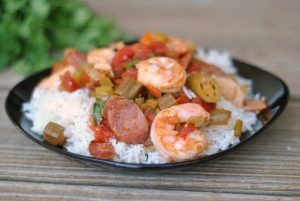 Good recipe and great picks!!! Funny you should ask…it’s potatoes and cauliflower…recipe coming soon! 🙂 Thank you! I’ve never watched The Biggest Loser so can’t comment on the show, but this chicken does sound very yummy! Can you believe I’ve never made fried chicken, real or faux either?? 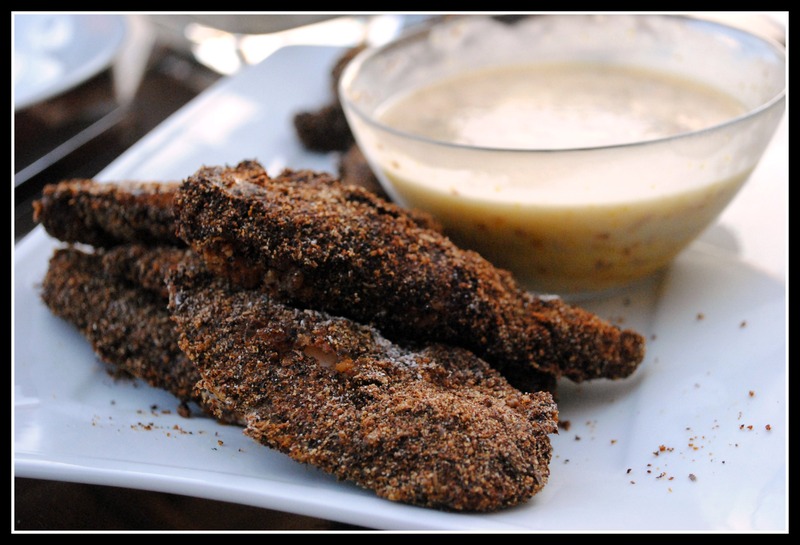 Definitely going to try this with the honey mustard dipping sauce. Thanks for sharing! So glad you shared this prevention rd classic again! I’m meal planning + grocery shopping today and totally will add this. I have panko breakcrumbs on hands so I’ll be using those for extra CRUNCH! Hope you have a great trip! What do you think would be a good substitute for the egg whites? I could try using “flax eggs” instead…still getting the flax seed in! 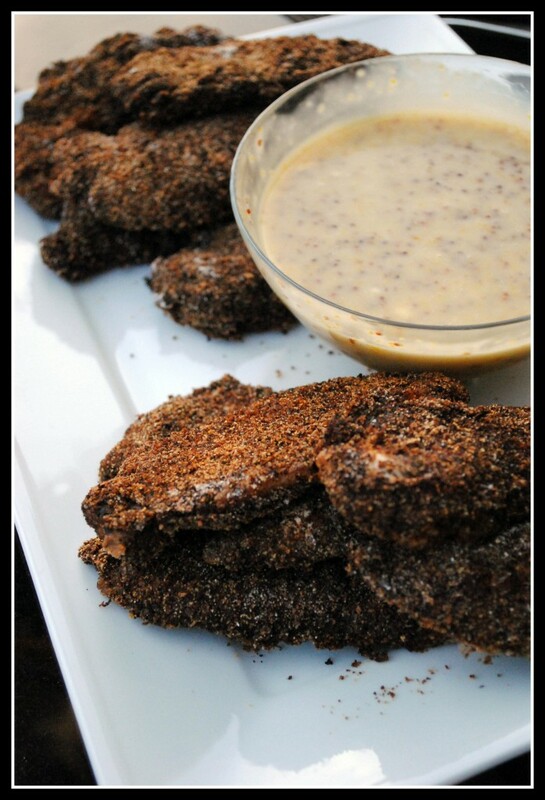 Sounds yummy and something my kids would eat, and I’m loving the simple honey mustard recipe! Milk or a flax egg would work! Before I read the whole thing I was like “why is your chicken so dark? !” Love your improvising! But I really think I need to make cheddar beer bread! 😀 Have a safe trip home! I totally love this method of “frying” chicken and fish. In the long run, I think it’s much easier than the mess of truly frying. I often marinade chicken in buttermilk. It comes out so moist and tender, but I haven’t heard of dredging in whipped eggs whites. I can’t wait to give this recipe a try. Have a good week. I’ve been thinking of doing something similar with the Gardein faux chicken. I also have been known to drink honey mustard sauce – one of my favorites. That looks like a great recipe! Hi Nicole, this looks delicous. Hope you had a good trip. This looks amazing! 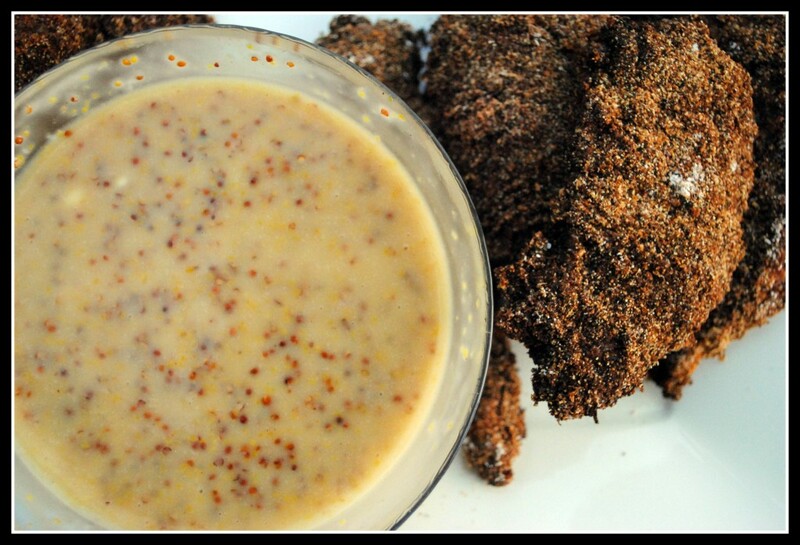 I love honey mustard so I am glad you posted this recipe. Soo simple! I have to say, I do love a good ranch dip but honey mustard is up there! Yum!